National City Christian Church’s first pipe organ was built by the Ernest M. Skinner Organ Company of Boston, Massachusetts and installed in 1930 upon the completion of the church. The organ, Op. 824, had four manuals, 54 ranks, and 3,514 pipes. It was quintessential E.M. Skinner, with its large scale diapason stops, lush strings and an array of colorful orchestral reed stops. The renowned concert organist Virgil Fox practiced and played recitals upon the organ while serving in the Air Force during the Second World War while he was stationed at the chapel of Walter Reed Medical Hospital. This organ was used to accompany the great operatic soprano Leontyne Price at the state funeral of President Lyndon B. Johnson in 1973, one of its last major musical offerings before being reworked in later years. After 45 years of faithful service, the firm of M.P. Möller of Hagerstown, Maryland, extensively rebuilt the Skinner organ in 1976. Under the direction of Donald M. Gillette and Ronald F. Ellis and the guidance of Minister of Music Lawrence Schreiber, Möller created a new 105-rank instrument of five divisions (Great, Swell, Choir, Positiv and Pedal) and 5,391 pipes controlled by a new four-manual console. At that time, some 30 ranks of the Skinner organ were revoiced and used in various divisions within this new instrument. Of those 30 ranks, only eight (English Horn, Flute Triangulaire, Flute Harmonique, pedal Principal and Contra Bass, among others) were retained in their original and untouched condition. 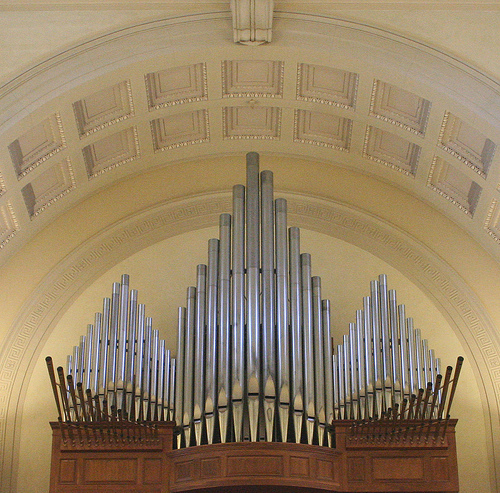 Hundreds of donors, both local and nationwide, contributed funds to Möller’s landmark instrument, one that featured the best of the “American Classic” organ building ideals. It was celebrated widely for its variety of colorful flute and reed stops and its formidable 30-rank pedal division, including Möller’s signature “harmonics” stops meant to produce the effect of 32’ and 64’ ranks. Recitals the first season featured Virgil Fox, Marilyn Mason, Albert Russell, Clyde Holloway, Robert Baker and Lawrence Schreiber. 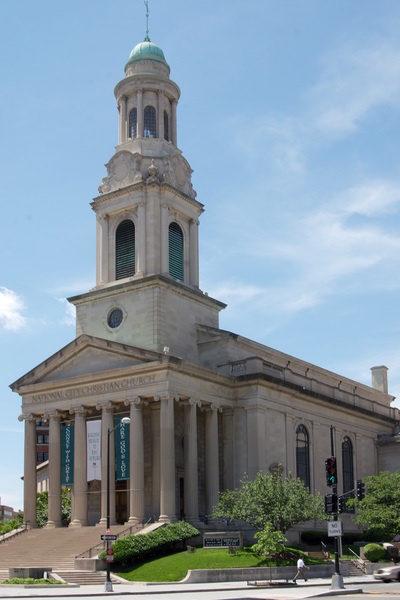 In 1980-81, a major renovation of the sanctuary surpassed not only the original splendor conceived by architect John Russell Pope, but achieved a superb acoustical environment ideal for both music and the spoken word. Into this jewel-like setting was added the Pearl Neugent Nordan Gallery Organ in the rear balcony. This independent instrument of 16 ranks, with its towers of shining silver pipes and separate two-manual console, stunningly crowned the visual impact of the building. Because of its skillful design and placement, the Gallery Organ’s full and direct sound suggests an organ of many more pipes than it actually possesses. This instrument includes a brilliant, horizontally mounted Trompette-en-chamade on 10 inches of wind pressure. This trumpet stop, at its first hearing, was described by The Washington Post as “the most commanding Washington has ever heard.” The instruments’ most famous and popular feature, though, is its 61-note set of Whitechapel English handbells, custom designed and built for this organ and the first of its kind in the world. Ten small doors open when the Handbell stop is drawn to display the bells, which are elegantly lit for all to see. In 2003, under the guidance of Ministers of Music Edward Moore and Marvin Mills, a renovation project was undertaken to upgrade the electrical systems of both organs and install a new multi-memory, solid state computerized operating system to control the organs’ vast resources. 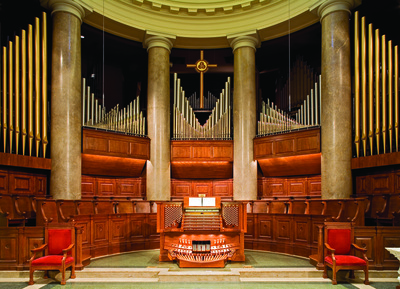 The new system was designed and built by Solid State Organ Systems of Alexandria, Virginia and, to accommodate the new system, both chancel and gallery consoles were refurbished, with the gallery organ console given the ability to play, through “blind pistons”, the full resources of the chancel organ. Significant alterations were made to the layout of the draw knobs and controls of the five manual chancel console. In addition, finances were secured for comprehensive, twice monthly tuning and maintenance of the organ, a remarkable benefits which continues to this day. In 2007 and early 2008, the Pearl Neugent Nordan Gallery Organ underwent significant mechanical renovation work, including rebuilding and cleaning the Handbell stop’s playing mechanism and the replacement of swell expression shades and motors. The chancel organ received four digitally produced 32’ stops and one 64’ stop, designed by the Walker Technical Company of Zionsville, PA, to replace the unsuccessful harmonics stops installed by Möller. The immediate future will see a new pair of E.M. Skinner-inspired string and celeste ranks in the Swell division, the addition of a new, 10- rank, independent Solo division, increase and stabilization of wind, the addition of several more ranks of pipes throughout the organ, the cleaning and revoicing of the chorus reed stops, and significant tonal refinement of the entire instrument.